[AUTO](VC):When your guardian is retired, you may put that card into your soul. 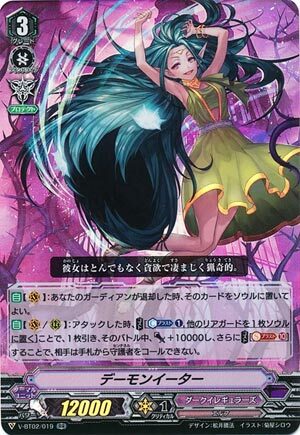 [AUTO](VC/RC):When it attacks, COST [Counter Blast (1) & put one of your other rear-guards into your soul], draw a card, and until end of that battle, it gets [Power]+10000, COST [Soul Blast (10)], and your opponent cannot call sentinels from his or her hand. For when you’re decently confident you won’t need another go with Death Anchor next turn, you go into this for the Waterfall play. Now, the combo requires four rear-guards and a card in hand to pull off fully, but the finish play is neat, and in the event you must ride her first, the first skill to load up guardians to the soul is not unwelcome, and once you DO hit Death Anchor she’s in the soul where she belongs. Has some combo potential with Ghoulish Despoiler to recycle PGs but personally I’d just go one way or the other as far as backups to Death Anchor go.